According to Grandad a true cannelé has to be soft on the inside and crunchy on the outside. The tall size, accompanied with vanilla ice cream, is the perfect dessert for a dinner or special event. The small size is perfect as a cute and tasty bite with tea and coffee. Combine it with a small madeleine and a spoonful of vanilla ice cream and you will have what we call in France the perfect cafe or tea gourmand. Due to their size, the small cannelés are also perfect for events as sweet canapés. Price Start at £200; contains about 80 cannelés. Grandma always said that a good brioche is a brioche " bien beurrée"... meaning well buttered ! Indeed butter is key in our brioche and it is what makes the singular taste of this typical French cake. Our brioche is of course good with jam and butter (in the true French tradition, there is never enough butter!) but they are also very good with ham and cheese, when savoury is desired. We remember our Granddad who use to eat brioche with ham, cheese and bechamel ! Our brioches come in individual portions. Very cute and easy to eat, they are perfect for children's parties and events. Madeleines have always been the little weakness of Amandine ever since she was a child. She likes them with jam for breakfast, as an afternoon snack with spreadable chocolate and dipped in some milk, or even just one on its own. We remember that she used to sneak into the bakery to have one when nobody was looking! The madeleine is indeed a kids' favourite! No matter which size, it will make the perfect treat for a children's party. The tall madeleine is great for an afternoon treat. The Plain Madeleines is subtlety flavored with lemon zest and vanilla bean. The Filled Madeleines hides a delicious surprise on the centre: Home made Passion fruit jam or Nutella. The small Madeleine (so very cute!) will work well combined with the small cannelés for luxurious events. Our Coeur Coco comes in individual portions. A sweet heart just for you or to share with the loved ones. The Tarte aux Noix is our mothers' favourite, so much our grand-parents had to make sure they saved a couple before our family dinners. 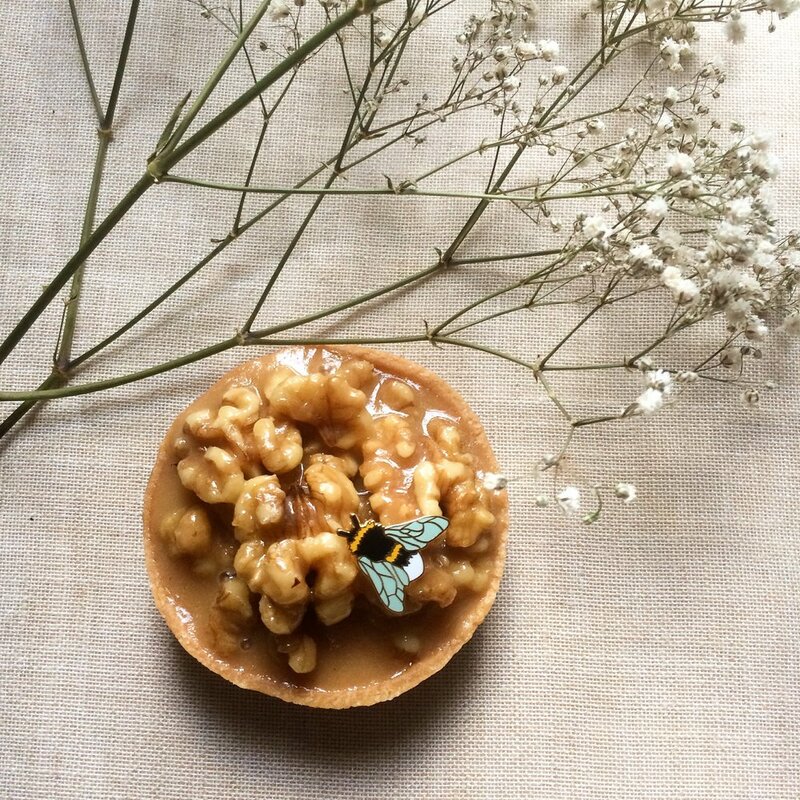 A handful of Walnuts on a sweet dough tart with an irresistible honey garnish. It comes in individual portions and is ideal as desert after a lovely meal. The chocolate tartelette is definitely for the choco- addict! it is made with the most refine chocolate Valrhona and has a layer of delicious raspberry jam and toasted almonds inside. Delivery in London from Zone 1, to as far as our French vintage bicycles can take us! Find us every Saturday in Archway Market from 10am to 5pm and every Sunday at Chatsworth Road Market in Clapton from 11am to 4pm.